Monthly subscription boxes have been very popular these days with curated snacks, beauty products, jewelry, and other goodies being delivered to doorsteps every month! 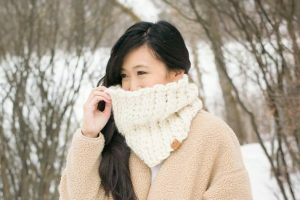 As a crocheter and knitter, I’m delighted to see that several knit and crochet subscription boxes have been developed as well! Getting a new pattern and the yarn to make that pattern is a fun surprise and encourages new projects that you might not normally try. Ashleigh, the crochet blogger and designer behind Sewrella, has started a crochet subscription box called “Happy Yarn Mail”, and she sent me her first debut box to try out! I will show you what was inside and share about why her boxes stand out! 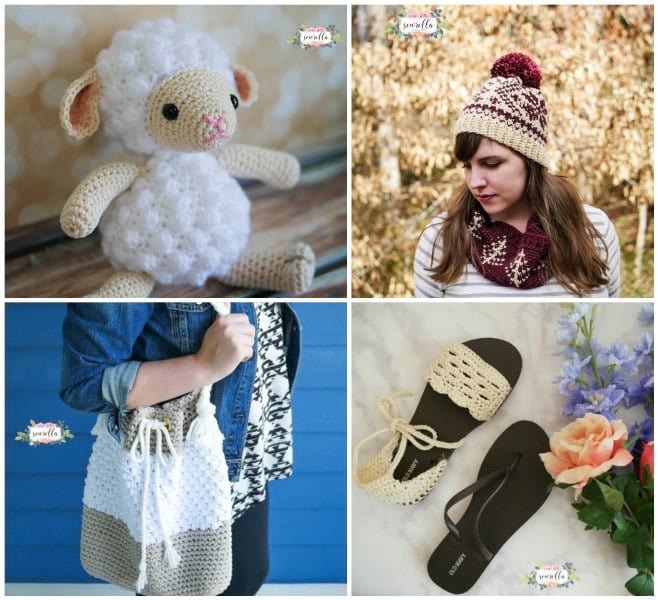 You might recognize some of Ashleigh’s designs on Pinterest such as her Little Crochet Lamb, Faux Knit Fair Isle Crochet Toque & Cowl, The Mykonos Bag, and Crochet Sandals with Flip Flop Soles! Each box contains an exclusive crochet pattern designed by Ashleigh specifically for Happy Yarn Mail (HYM), the materials needed to make the pattern (hooks not included), and extra crochet freebies designed in collaboration with other indie makers exclusive to HYM. You can get a box sent every month or just purchase one box to try it out. I immediately loved the bright and cheery packaging when my box arrived in the mail! Those colourful sprinkles are so much fun! Let me show you what was in the first Happy Yarn Mail box! This box was actually the March box, so it contained the pattern to make this adorable “Chocolate Bunny Crochet Pillow“, perfect for Easter! The pattern instructions were printed in colour and the box contained a delightful handwritten note as well! To make this pillow, Ashleigh included a large amount of brown yarn as well as small bits of pink, yellow, and green yarn (all Lion Brand Yarn’s Vanna’s Choice). I love how Ashleigh included exactly how much was needed for the accessories so no yarn goes to waste- she hand wound each little skein of yarn! The box also contained the fiberfill needed to stuff the pillow and once again, it was wonderful having the exact amount needed! Ashleigh designed this “Maker Nation” mug for her debut box! I know many of us are coffee and tea lovers, and having a mug that helps declare our creative spirit and craftiness is awesome! You can also purchase this “Maker Nation” decal separately in Ashleigh’s Etsy shop HERE! I love how she included some tea and honey so we can sip on a warm drink while crocheting our chocolate bunny pillows! I enjoyed working through Ashleigh’s pattern and having all the yarn that I needed to make it look exactly like hers! This particular pattern was very fun with its clever shaping to get the silhouette of the chocolate bunny. Ashleigh did a great job designing this pattern, and there was plenty of brown yarn left over to make another one! How adorable is my finished Chocolate Bunny? This would be such a fun gift for chocolate lovers or bunny lovers! I myself will be gifting this pillow to my bunny-loving cousin! Who else has fond memories of chomping on the bunny ears as a child when given these chocolate bunnies? If you love this pattern but missed out on the first Happy Yarn Mail box, Ashleigh is also selling this as a separate pattern in her Etsy shop HERE! Here is a video that Ashleigh made to show you what was inside the March box (the one I reviewed)! Happy Yarn Mail stands out from other crochet subscription services because Ashleigh herself is a successful crochet blogger and designer! She designs each exclusive pattern specifically for her boxes, so you know that you are getting a high quality pattern that is not available anywhere else. Other boxes include patterns from a variety of designers, but if you like Ashleigh’s style and how she writes her patterns, you will love these boxes since you will get one of her fun patterns every month along with some other goodies! Each month’s box goes on sale at the beginning of the month and they ship during the last week of that month! Her May boxes will be available for purchase on Monday, May 1 at midnight EST, and I have a feeling that they will sell out quickly! Visit her site HERE to read more about them and to purchase your own HERE! Ashleigh has provided my readers with a special discount code if you are interested in getting your hands on some Happy Yarn Mail! Use code “ALLABOUTAMI” to get $5 off your box! Please note that Happy Yarn Mail currently only ships to the US and Canada, and shipping is calculated based on how far the box needs to ship from Florida where Ashleigh lives (not a flat rate). Ashleigh has done a fantastic job developing Happy Yarn Mail, and I can’t wait to see what the projects are every month! She hand packs each individual box with her fiance, and the first month they packed 125 boxes while this month they packed 220 boxes! I can only imagine how much labour and love has gone into Happy Yarn Mail, and I’m delighted that I can help them spread the word! If you like being surprised with a new pattern every month or want to gift a box to a fellow crochet enthusiast, do check out Happy Yarn Mai! How exciting is it to look forward to a brand new crochet pattern and extra goodies every month? Note: I was provided with a Happy Yarn Mail subscription box for review! All opinions and views expressed are 100% my own!